This illustrates another advantage of self-hosted WordPress over WordPress.com, in that you aren’t limited to just a link in your sidebar widget. I appreciate Katie’s question, because it encouraged me to update my sidebar and include the form instead of the plain HTML link. 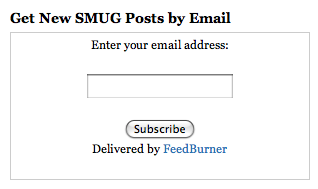 I know there are other plug-ins that you can install, and which can provide email delivery of posts, but I like the statistics I get with Feedburner, both for my email subscribers and those who take the RSS feeds. Follow the steps above and add an email subscription option to your blog, either via a form or a subscription link, through a text widget. Cool post, thanks for walking us through that, much appreciated ! 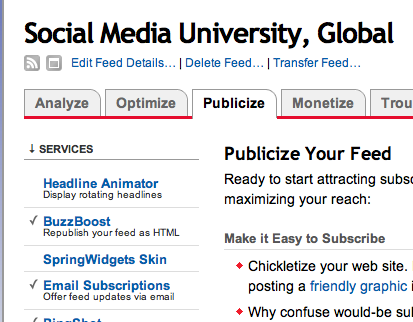 My next question is about “FeedFlare”….I would love to embed those little links at the bottom of the post which would allow a person to “Share on Facebook” “email this” or “email the author” But the instructions tell me “Note: The following instructions are not for use with blogs hosted WordPress.com or any WordPress MU–powered installation. Yeah! Thank you for walking me through this. Now my doctors can subscribe.